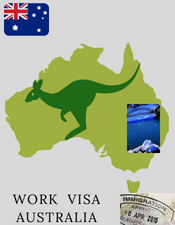 Work visa : Australia, How to apply? Documents and Requirements. Australia offers many job opportunities to skilled professionals that allow them to migrate here. The benefits are mutual with the employee gaining a beautiful abroad experience in this culturally diverse country and the Australian economy reaping the improvements which help to better their workforce. Below are the popular categories of visa issues by Australian government. There are many other special types of work visas like Distinguished Talent, Business Owner etc. Most of the people will belong in the categories listed below. This type of work permit is issued to that individual who can demonstrate that he has the necessary skills and qualifications required by for a specific occupation that has been listed under the Skilled Occupation List (SOL). This is a permanent type of work visa is issued to those individuals who are qualified to work for the improvement of the Australian economy (like State authority or Business). The only criterion to be eligible for this particular visa is that they must be sponsored by the employer. As announced by PM of Australia on April 18 2017 temporary work visa - 457 will be abolished and replaced with the entirely new TSS visa. This is a temporary work visa issued to those overseas workers who are being sponsored by their employers. The employers must satisfy specific nomination and sponsorship criteria for the employee to be eligible for applying for this visa. Workers can be issued visa up to 4 years (TSS visa category 'Subsequent entrant' can stay as long as visa is valid). Processing time for TSS visa varies from 30 days - 3 months. 457 visa (temporary visa) will be replaces with TSS visa in March 2018. The goal of this visa is to provide a work visa for up to two years or up to four years (depending on requirement) and will require sponsoring business/company to prove the genuineness of skill shortage in Australia. It will require sponsoring institution to pay market salary etc. ; workers might have to prove English proficiency, need to have minimum work experience of 2 years and age should be less 45 (at the time of application, etc. TSS will also lead the path to permanent residency. This is a permanent work visa that is issued to overseas workers who are sponsored by their employers. This type of visas is issued to increase Australia's competitiveness globally as well as filling up the skills shortages in the market. This is an opportunity offered to individuals in the age group of 18-30 from reciprocating countries to take up a short-term employment while vacationing in Australia. This visa expires after 12 months, and the candidate needs to meet certain health requirements to be eligible for it. Personal Character Assessment (Form 80). Curriculum vitae, Mark-sheets and certificates. The first step involves determining the category of work visa based upon the job offer. The applicant must satisfy the requirements of a points-based assessment, if applicable. The employer must complete an online nomination/sponsorship form, if applicable before the individual can apply for the visa. The individual must fill out the online application form of the particular visa category. Any relevant information and supplemental documents must be submitted along with the application. The visa application fees must be paid for the visa to be processed. Around 190,000 permanent visas and 100,000 temporary visas are issued by the Australian government each year. Visa processing usually takes around 8-10 weeks so early applications are encouraged for a stress-free visa process.